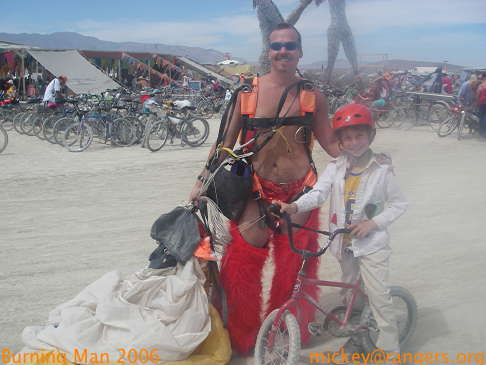 Moments from our family daytime wanderings across the playa. We start off with our family view from atop an art bus. Since we're sitting in the middle our perspective is a bit blocked by people, but we can see the art on the playa and other vehicles, just not the folks just below us. It'll do; it's a great break from walking or being in camp. The breeze doesn't hurt. What was this crew doing? I can't recall, but it was loud and spirited and the kids loved it. 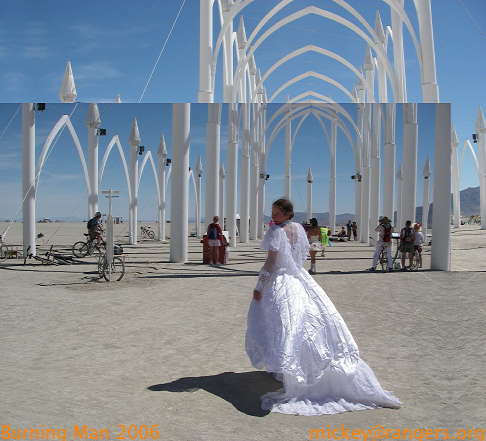 It's not often that one sees a wedding dress in the playa cathedral, but here it is. The ceremony was a short time later, accompanied by a lot of clapping and cheering. "Look," cried Lila, "a bride!" 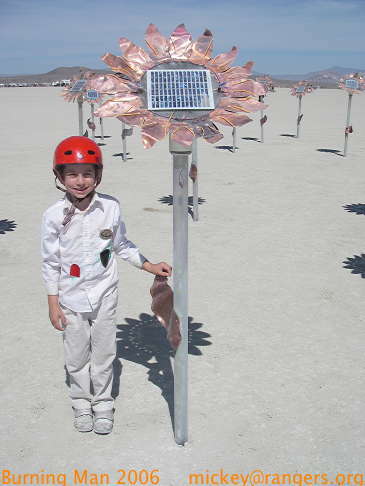 Isaac really loved the solar-powered sunflowers. He loved watching them move to follow the sun. 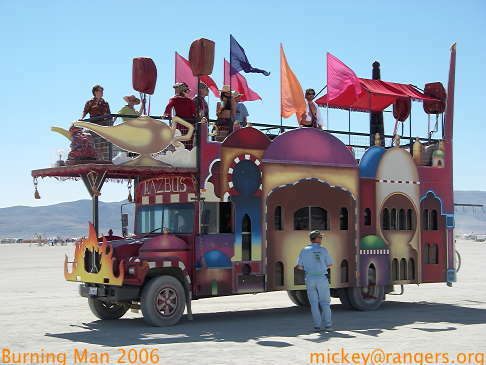 We returned each trip across the playa, day or night. 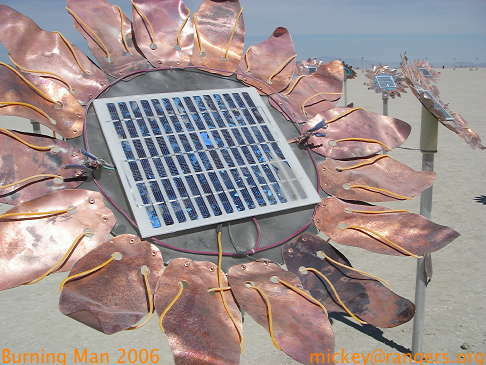 Per Isaac's request, a close-up of the sunflower. 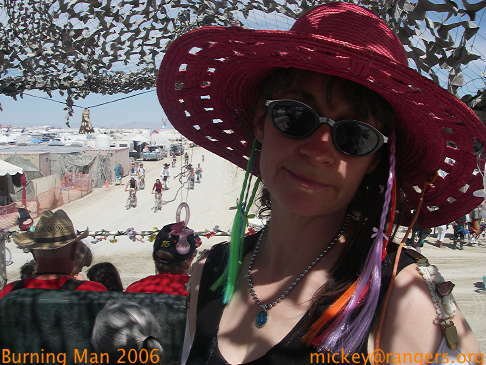 In the photo the el-wire casts a discordant visual tone that didn't come across as much on-playa. The KAZBUS rumbles on by, then putters to a stop. 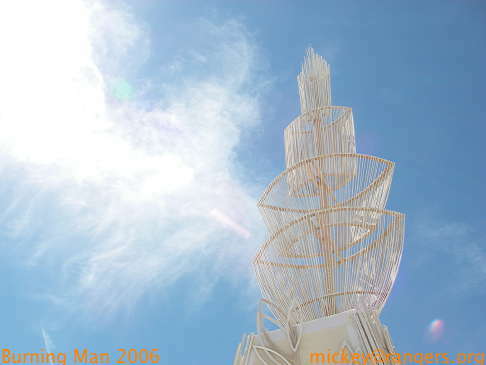 The Temple's spire reaches high into the clear sky, the wispy white clouds slowly marching across the day. 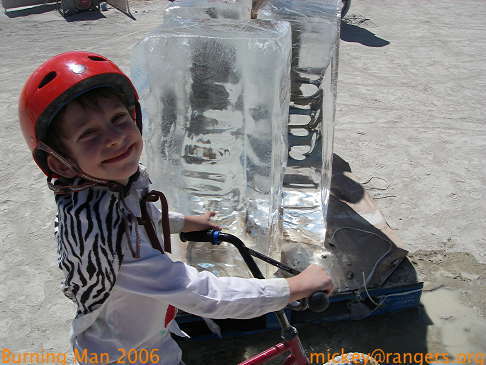 Isaac really enjoyed the cold refreshing moment of contact with this ice sculpture. Incongruity is such a great thing. Oy, here's my monkey-tailed wife, Rose! I love her costumes, and her ability to wear them while riding. 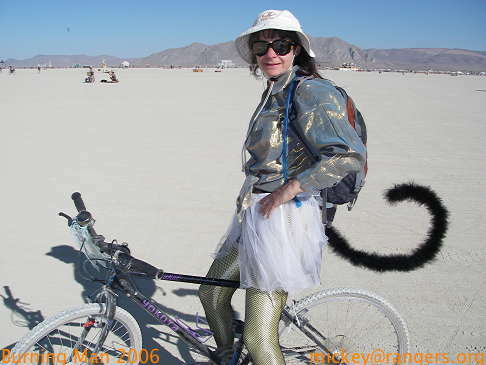 With a tail like that I'd have either fallen off or gotten it caught in the spokes within the first minute or two. 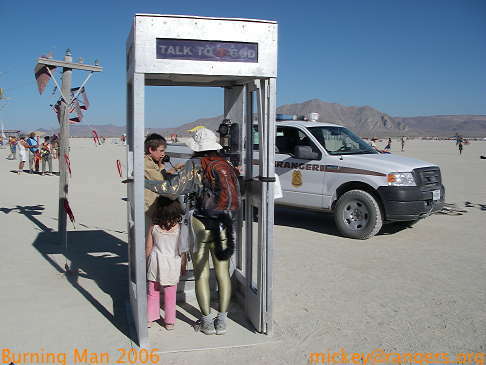 Isaac visited the Talk To God phonebooth, but Rose thought the language might have been a bit salty. Isaac didn't seem to take any of it in, if it was. All three of us are at the Black Rock Roller Disco, run by Dee; the two of us were in the Golden Gate Park Skate Patrol back in the mid- to late-1980s. He's never taken off his skates. I was impressed that Dee remembered to bring up kid-sized skates; there were a few among the dozens of adult sizes. 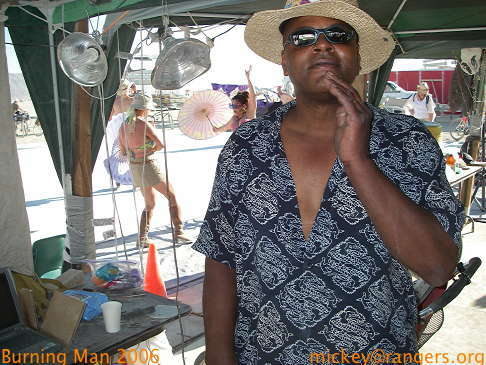 Here's one of the parents from the kids' school; he's in Dee's posse. Seeing old faces in new contexts, rare as that is, is one of the pleasures of the event. 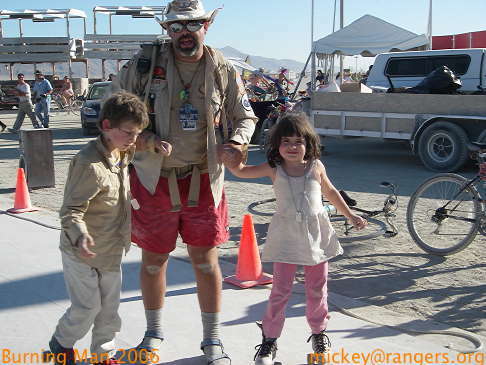 Another one of the pleasures is watching my kids interact appropriately with adults, especially Burning Man adults. Here Lila and Isaac play foosball. Rose, at rear, is doing a mini PTA thing. 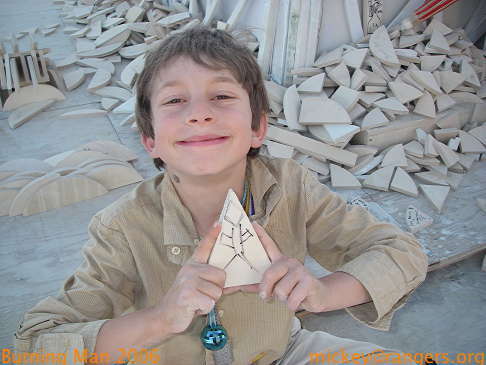 The Temple, with it's participatory process of adding your writings and drawings to the structure for later immiolation, is a draw. The kids love coming back again and again. 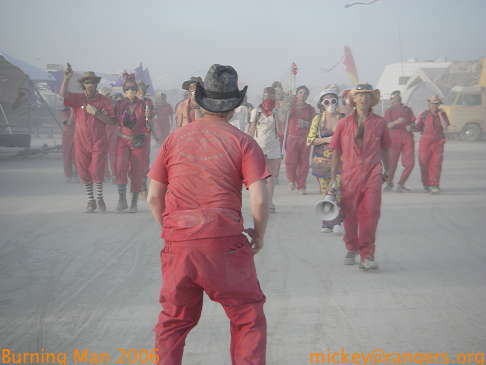 Here Isaac shows off his interpretation of the Man, with arms raised pre-burn. Lila, in contrast, was into story-telling. 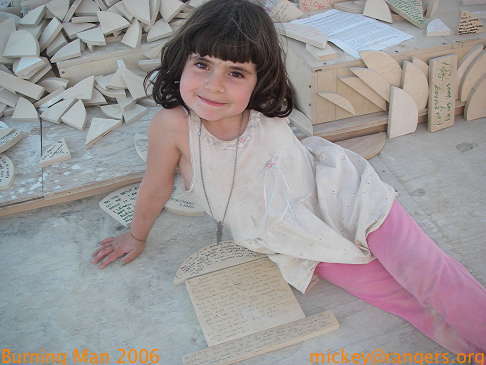 With Rose or I taking dictation, she filled tile after tile. Some were affixed high, others low, all to a metric that I couldn't discern (an she couldn't describe, but she knew when it was just right). Stopping off at the Center Camp Café for a bit of shade and hydration and refreshing culture is always valued. Snacks too. 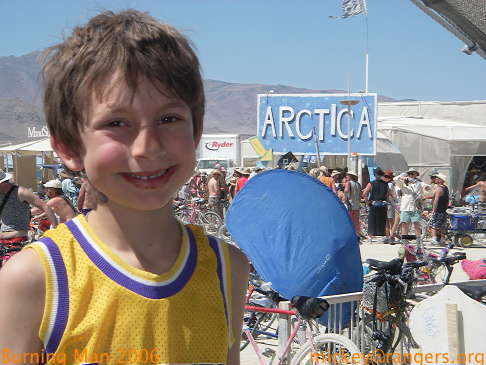 Chocolate-faced Isaac poses in front of the Camp Arctica ice-sales queue. 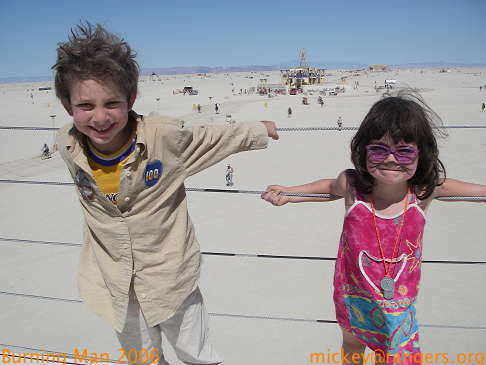 Lila & Isaac up high, on a huge cube placed direct line between the Man and the Temple. It was a daunting straight bunk-bed-style ladder traversing the three levels, but everyone did it. 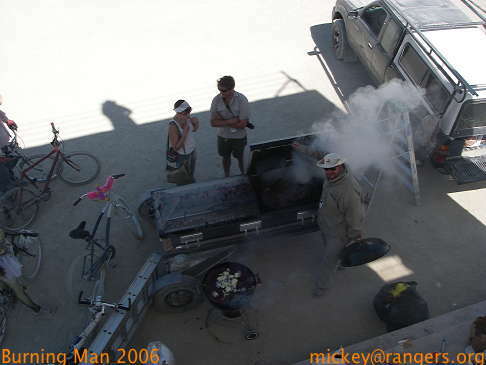 From on high we spy Ranger Cadillac grilling tri-tip steak in his hearse-o-grill. Damn, that was tasty meat, and the chunk he later graciously delivered to us in Kidsville was such a favorite of the wee ones that it was nibbled on for every subsequent meal, breakfast, lunch, and dinner; the kids demanded it. 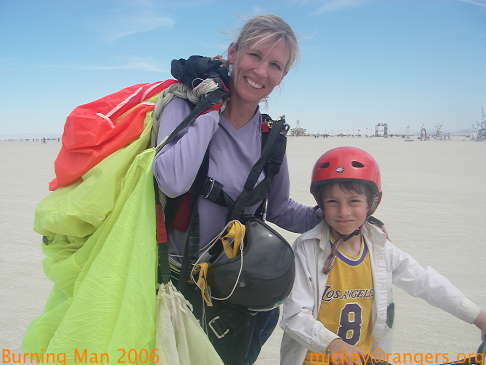 One afternoon we heard the whine of the parachute plane cease. We looked up and saw several people jumping. Isaac dove onto his bike and we raced around, following their descent, right into the Center Camp ring! Here's Isaac with the male of the pair. My wife Rose, somewhat used up. The rigors are many: dealing with me, both kids, and being a Ranger Widow. She does a great job, especially the on-playa cooking, which is daunting to me.